Emotions can screw up your decision-making — that’s an idea that behavioural scientist Francesca Gino explores and confirms in an article published in the Harvard Business Review. After providing estimates, they watched a short video clip. Some participants viewed a National Geographic special that showed beautiful fish in the Great Barrier Reef. The other group saw a movie clip about a young man who is bullied. After seeing the videos, members of both groups were given another person’s weight estimate of the person and asked if they’d like to reevaluate or change their original estimate. For participants who saw the clip of the man being bullied, their anger and frustration seemed to carry over into the next task. Approximately 74 percent failed to listen to the other participant’s estimate. On the other hand, just 32 percent of participants from the National Geographic group ignored the advice. …even when you’re at work. In fact, a classic study conducted by Bond University professor Cynthia Fisher showed there are five common negative emotions people frequently experience in the workplace: frustration/irritation, worry/nervousness, anger/aggravation, dislike and disappointment/unhappiness. It doesn’t matter if you’re a highly emotional person or fairly calm, you’re going to experience these emotions in your professional career — especially when you’re a business owner or an entrepreneur. Sometimes your emotions do a good job of directing your actions, but this isn’t the case when it comes to finances. If you let emotions control financial decision making, you will lose out almost every time. One of the biggest issues people have is quitting when they’re ahead. When things are going well, it’s easy to keep pushing. Unfortunately, this isn’t always the best strategy. The economy, the real estate market, the stock market, consumer demand — all of these things experience ebbs and flows. Just because something is going good or bad doesn’t mean it will continue to do so forever. “One day you’re winning and making a lot of money, the next day you don’t seem to be able to put a foot right. It’s also a game of fine lines. One mishap here, one misjudgment there and you can go from what ‘should’ have been a highly profitable day to a big losing day,” explains NetPicks, a leading online trading system. In fact, NetPicks is big on adhering to the “Power of Quitting.” It seems counterintuitive to quit while you’re ahead. You potentially missing out on more gains. However, this ultimately prevents you from taking unnecessary losses. In the long run, it’s highly profitable. Whether you’re day trading or running your company’s finances, establish principles that tell you when to move on. This removes emotions from the process and improves decision-making even when the adrenaline is pumping. When things aren’t going well for your business, or you find yourself in a tough situation where the outcome looks bleak, it’s easy to feel sorry for yourself. As you might guess, this often leads to some pretty dangerous mistakes. 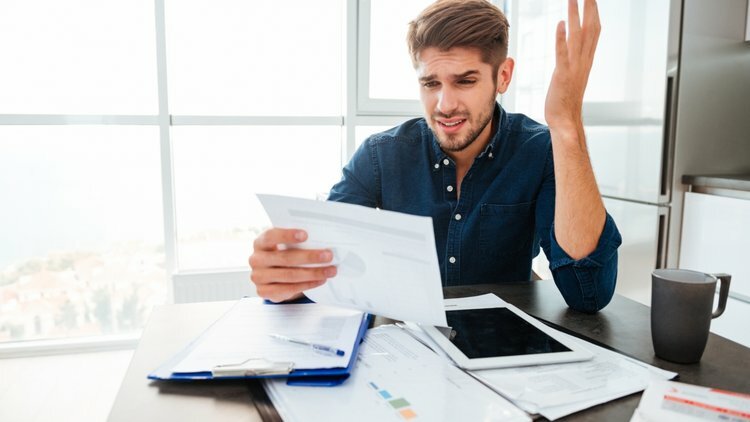 The “I deserve this” mindset is most common when it comes to personal finance, but it can also rear its ugly head in your business’ financial decisions. It’s easy to say, “We deserve this,” even when the numbers don’t actually line up. You’ve heard people say you just need to take a deep breath when you’re feeling stressed. Perhaps you’ve even said it yourself. But this isn’t just a cliché saying — it actually works. Slow, conscious breathing can calm you down in highly stressful situations. If you find yourself sitting in front of a spreadsheet, stressing out over some important financial decision, then step away and take a deep breath. This deep breath isn’t going to give you any answers. However, it will put you in a calmer frame of mind. This will help you make disciplined, calculated choices. It’s imperative that you do a little digging and attempt to understand who you are and what sort of triggers cause you to feel different emotions — particularly negative ones. By identifying these triggers, you should be able to avoid negative situations and prevent the onset of heightened emotions. For example, let’s say your blood boils every time you review your company’s P&L statement. Instead of reviewing the P&L statement alone at the beginning of the day, maybe it’s best to review it alongside a couple of your trusted advisors at the end of the day (when it won’t affect the rest of the workday). Small steps like this can have profoundly positive results. When emotions guide financial decision making, it’s almost always because there are no financial goals in place. A lack of goals means a lack of structure, which gives you free reign to listen to your emotions. If you want to avoid putting yourself in compromising situations, take the time to establish clear and concrete goals that guide decision making. You are the sum of the four or five people you spend the most time with. When it comes to your business, you are going to adopt the personalities of the people you work most closely with. Focus on disciplined, poised people if you want to position yourself for success. Surrounding yourself with the right people will look different for everyone. The key is to find people who think differently and have unique personalities. Too much of one trait will prevent you from making smart, balanced decisions. If you’re naturally pessimistic, optimistic people will help. Surround yourself with even-keeled people to reduce stress. Emotions aren’t a bad thing. The fact that you feel happiness, sadness, irritation, anger, anxiety, anticipation and other emotions is what makes you human. It’s what separates you from so many other species. But at the same time, you can’t let your emotions affect how you make financial decisions in your business. It’s easier said than done to get your emotions in check. It takes years of practice and you’ll never get full control. Having said that, the more conscious you are of your emotions, the better you’ll get. Be proactive and take control of your company’s finances. Previous Post Happy New Year! Now, How Exactly, Are You Going to Make Those Resolutions Stick?